Providence, RI (11/10/2011): Rhode Island Reds legend Zellio Toppazzini is one of four people selected for induction into the American Hockey League Hall of Fame as the Class of 2012, the AHL announced. Honored along with "Topper" by the AHL Hall of Fame Selection Committee as the seventh group of enshrinees are Joe Crozier, Jack Gordon and John Stevens. The Class of 2012 will be honored as part of the festivities at the 2012 AHL All-Star Classic in Atlantic City, N.J. The American Hockey League Hall of Fame Induction and Awards Ceremony is scheduled for Monday, January 30, at the Circus Maximus Theatre at Caesars Atlantic City. Formed in 2006 to recognize, honor and celebrate individuals for their outstanding achievements and contributions in the American Hockey League, the AHL Hall of Fame is housed on-line at www.ahlhalloffame.com and is accessible to fans worldwide with the click of a mouse as part of the AHL Internet Network. The Network also includes theahl.com and all 30 official team sites, and hosts more than 250 million page views each year. In operation since 1936, the AHL continues to serve as the top development league for the players, coaches, managers, executives and broadcasters of all 30 National Hockey League teams, as well as the NHL’s on-ice officials. By season’s end in 2010-11, more than 87 percent of all NHL players were American Hockey League graduates, including more than 200 former first- and second-round draft picks and more than 300 players who appeared in both leagues last season alone. Considered by most to be the greatest player in the long history of professional hockey in Rhode Island, Zellio Toppazzini was a prolific offensive talent over 15 American Hockey League seasons. Toppazzini broke into the pro ranks with the Hershey Bears in 1948-49 and split his first three seasons between Hershey and the Boston Bruins. After beginning the 1951-52 campaign with the AHL’s Cincinnati Mohawks, the right winger was traded to the Providence Reds, setting the stage for a legend to be born. The native of Copper Creek, Ont., found a new home in Providence. Toppazzini notched 45 points in 33 games with the Reds after the trade and helped his new team reach the Calder Cup Finals. A year later, he led Providence in goals and points, and his 74 points in 62 games earned him Second Team AHL All-Star honors in 1954-55 despite the Reds’ last-place finish. In 1955-56, Toppazzini was at the heart of one of the most impressive seasons by any team in AHL history, one that helped cement his place in Reds lore. “Topper” was named a First Team AHL All-Star, leading the circuit with 71 assists and 113 points in 64 games as Providence completed a worst-to-first turnaround, rolling to a league-best 45-17-2 record. He then added seven goals and 13 assists in just nine playoff contests – becoming the first AHL player ever with 20 points in a single postseason – as the Reds won the Calder Cup. The championship would be the franchise’s last, but Toppazzini remained one of the elite players in the AHL for several more seasons. He recorded 53 points in 44 games while also seeing NHL action with the Chicago Black Hawks in 1956-57, and after sitting out the 1959-60 season he returned to the Reds and led the team with 31 goals during the 1960-61 campaign. Toppazzini’s connection to Providence continued beyond his retirement in 1964. He made Rhode Island home for him and his family, and later coached at Providence College. In 2000, the Rhode Island Reds Heritage Society selected Toppazzini as the team’s “Player of the Century,” an honor befitting the franchise’s all-time leader in goals (279), assists (448), points (727) and games played (650). Toppazzini, who passed away in 2001 at the age of 71, ranks 13th on the AHL’s all-time scoring list with 786 points in 785 games. One of the most identifiable figures in the annals of the Rochester Americans, Joe Crozier helped lay the foundation for what would become a flagship franchise through a dominating run of achievements. 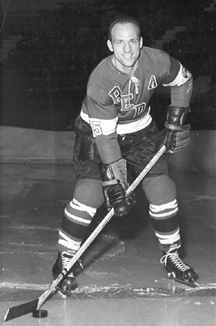 A native of Winnipeg, Crozier played 12 professional seasons as a defenseman, making AHL stops with the Springfield Indians and Providence Reds before he first joined the Rochester Americans in 1959-60. Crozier helped Rochester reach the Calder Cup Finals that season, and then closed out his playing career with the Amerks the following year. In 1963, Crozier returned to Rochester to become the young franchise’s ninth head coach in eight seasons, and in 1964-65, after he added the duties of general manager, Crozier’s club was the class of the American Hockey League. They went 48-21-3, setting a team record for wins that would stand for 34 years, then dispatched Quebec and Hershey to capture the franchise’s first Calder Cup. Crozier kept his Amerks on top of the league in 1965-66, winning a second consecutive Calder Cup after another dominating regular season. And following a loss to Pittsburgh in the 1967 Finals, he became the third head coach in AHL history to win three Calder Cups when Rochester reclaimed the title in 1968. Crozier left Rochester in 1968 and found success in other coaching stops, including the Cincinnati Swords and New Brunswick Hawks in the AHL. He returned to the Amerks for one last season in 1983-84, and guided the club to yet another Calder Cup Finals appearance before retiring from coaching. During his six full seasons as an AHL head coach, Crozier reached five Finals and won three league championships. Two other seasons in the AHL were cut short when he was promoted to coaching positions in the National Hockey League. With a career record of 305-199-46, Crozier’s .596 lifetime winning percentage ranks second among the 16 members of the AHL’s 300-win fraternity, and his Rochester Americans of the late 60’s remain the only team in league history to reach four consecutive Calder Cup Finals. Jack Gordon was a mainstay in the American Hockey League as both a player and a coach, achieving his greatest success with the Cleveland Barons. Gordon, a Winnipeg native, played 14 AHL seasons, breaking in with the New Haven Ramblers as a 19-year-old in 1947. He led the New Haven club in scoring with 83 points and finished second in the league with 60 assists in 1949-50, and after joining the Cincinnati Mohawks the following season he led that team in scoring for 1950-51. Gordon was acquired by the Cleveland Barons in 1951 and spent the next 11 years there. In 1953-54 Gordon set career highs with 31 goals, 71 assists and 102 points to finish as the runner-up in the AHL scoring race, and he tied what was then the league record with 18 postseason points as Cleveland captured the Calder Cup championship. Still producing at a point-per-game pace, Gordon transitioned into the role of player/coach in 1956, succeeding the legendary Bun Cook in running the Barons’ bench. In the first season under Gordon’s guidance, the Barons didn’t skip a beat, roaring to another Calder Cup title as the highly respected Gordon was named the league’s coach of the year. Gordon played his final game in 1960-61 and continued as Cleveland’s head coach through 1962, qualifying for the playoffs in each of his six campaigns. He remained the Barons’ general manager – winning his fourth Calder Cup in the 1963-64 season – until accepting a position as assistant GM of the New York Rangers in 1965. Gordon rejoined the Barons as head coach in November 1968 and spent two more seasons on the bench before returning to the NHL, where he would serve in coaching and management capacities for the Minnesota North Stars and Vancouver Canucks. In 602 games played in the AHL, Gordon totaled 181 goals and 434 assists for 615 points. His career coaching record stands at 267-234-48. A tough defensive defenseman, John Stevens was regarded as one of the top blueliners in the AHL during his playing days, and when injury forced him off the ice he found success as a coach as well. A native of Campbellton, N.B., Stevens was drafted by the Philadelphia Flyers in 1984 and made his professional debut with the Hershey Bears at the age of 18. His first four pro seasons were split between Hershey and Philadelphia, and he was a member of the Bears’ 1988 Calder Cup championship team. After signing with the Hartford Whalers in 1990, Stevens spent most of the next six seasons in Springfield, where he captained the Indians to a Calder Cup title in 1991. Three years later, Stevens was named the first captain of the Springfield Falcons and scored the first goal in Falcons history – one of just 21 goals he would score in his entire AHL career. He was also selected to be one of the playing captains for the 1996 AHL All-Star Classic, held at his first professional home: Hersheypark Arena. vStevens returned to the Flyers organization in 1996 and was again turned to for leadership on a new club as he was given the captain’s “C” for the first-year Philadelphia Phantoms. The Phantoms finished with the best record in the AHL in their inaugural season, and a year later won the 1998 Calder Cup title. An eye injury ended Stevens’ playing career in December 1998, but he remained with the club as an assistant coach under Bill Barber. Stevens was promoted to the head coaching position in 2000 and spent six seasons at the helm, winning another Calder Cup in 2005. He was promoted to the Flyers in 2006, first as an assistant coach and then as head coach, and is now in his second season as an assistant with the Los Angeles Kings. Stevens has participated in more than 1,400 regular-season AHL games as a player, assistant coach and head coach. His 834 games played are currently ninth-most by a defenseman in league history, and he also ranks 15th all-time with 102 Calder Cup Playoff games played. Stevens is one of 16 men in AHL history to win Calder Cups as both a player and a head coach, a group that includes AHL Hall of Famers Bun Cook, Frank Mathers, Fred Glover, John Paddock, Bruce Boudreau and fellow 2012 inductee Jack Gordon.